Vehicles approaching from the rear is the number one cause of bike/vehicle fatalities in the U.S. The revolutionary new Varia Rearview Radar from Garmin helps a create safer cycling environment by warning cyclists of vehicles approaching from behind up to 153 yards, and also warns approaching traffic of a cyclist ahead. 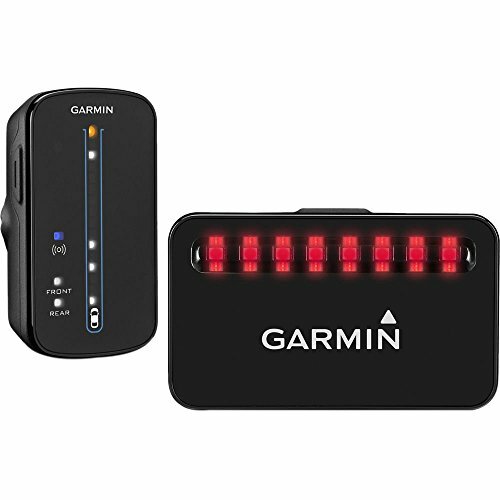 Works independently and integrates seamlessly with select Garmin Edge cycling computers. Indicates the relative speed of approach and distance of one or more vehicles at a time. The tail light brightens and blinks when approaching vehicles are detected for an extra measure of safety. APPROACHING VEHICLE INDICATION - The radar display unit (RDU) and compatible Edge cycling computers indicate up to 8 approaching vehicles from behind, giving the cyclist information about the distance and rate of approach. AUTOMATIC ADJUSTMENTS - The tail light brightens and blinks when approaching vehicles are detected for an extra measure of safety. Vehicles approaching from the rear is the number one cause of bike/vehicle fatalities in the U.S. THREAT LEVEL INDICATOR - Indicates the relative speed of approach and distance of one or more vehicles at a time.